Here’s how to make Southern fried chicken wings, those crispy battered little lovelies that Southerners believe—correctly—are the sweetest part of the hen. 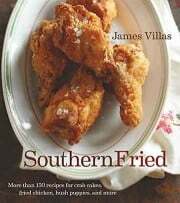 When author James Villas refers to “chicken wings,” what he’s actually referring to are the “drumettes” of the wings. You know, those meaty miniature drumsticks that everyone snatches first from the platter of mixed chicken wings and drumettes. Of course, this recipe works on the scrawny chicken wing portion of the wing, too. It also works just dandy on regular pieces of chicken—simply increase the time the chicken is in the oil by several minutes. 1. Remove and discard the tips of the chicken wings. If needed, separate the first and second joints of the wings with the tip of a sharp knife (this is only necessary if the flat wing part of the wing is still attached to the meaty drumette portion of the wing). 2. In a shallow baking dish, combine the flour, Parmesan, paprika, mustard, oregano, if using, and salt and pepper and stir until well blended. Pour the milk in a shallow bowl. 3. Working with 1 wing at a time, dip the chicken in the milk, then dredge it in the flour mixture, and then tap off any excess flour. Place the wings on a plate. 4. In a deep-fryer, deep-sided skillet, or Dutch oven, heat about 2 inches oil until it registers 350°F (177°C) to 365°F (185°C) on a deep-fry thermometer. Fry the chicken wings in small batches, being careful not to crowd the pan, nudging the wings so they don’t stick to the pan and turning them if necessary, until golden brown and cooked through, 8 to 10 minutes. (If the chicken wings are especially meaty, they may require a minute or so longer, just be careful not to fry them so long that they dry out.) Using tongs, transfer the wings to paper towels to drain. Rest assured, these chicken wings are just as good at room temperature as they are hot. 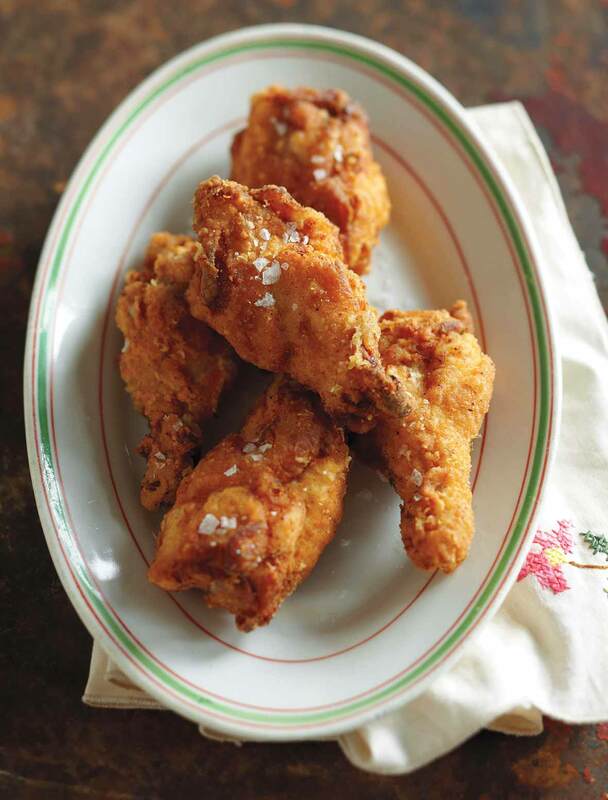 Southern Fried Chicken Wings Recipe © 2013 James Villas. Photo © 2013 Jason Wyche. All rights reserved. All recipes and photos used with permission of the publisher. Sometimes a recipe is just meant to be. My husband and I were craving Southern fried chicken this week. There's nothing better than crisp, flavorful breading on a tender piece of chicken—especially one with the unique flavor of grated Parmesan cheese. I have to admit, I already had thighs and legs at home ready to be cooked, so I tested this recipe out on those cuts of chicken instead of the wings. Of course this changed the cooking time (it took about 12 minutes on each side in the hot peanut oil). My only recommendation would be to make sure you have enough salt in the flour-Parmesan mixture; even though the Parmesan adds a salty taste to the crispy coating, I found it needed a bit more salt than I originally put in the mixture. I'd say for this amount of flour-Parm, probably a good tablespoon salt would be perfect, along with 1 teaspoon black pepper. May sound like a lot of salt, but fried chicken should have a ton of flavor in my opinion! Lastly, I loved the addition of paprika, oregano, and dried mustard here. This was a great coating for fried chicken of any kind, especially when served with collard greens and mashed sweet potatoes. I was very excited to test this Southern fried chicken wings recipe because I absolutely love chicken wings. This recipe was fantastic! It was easy, quick, and didn't make much of a mess despite the coating and pan-frying. I had all the ingredients I needed in the pantry, and I used a 10-inch cast iron skillet to cook all 24 chicken wings. I followed the recipe exactly as written, although the wings had an internal temperature of 210°F after I fried them. I will try taking them out a little sooner next time to see if I can get closer to 165°F. Still, the wings turned out wonderful! Even with the high temperature of doneness, they had a nice, crunchy batter and the meat was tender, juicy, and pulled off the bone with ease. Every one of my testers loved the wings. We served them with some hot sauce and ranch dressing as dips. The wings kept very well in the refrigerator, and when reheated in the microwave for 2 minutes, they were still tender and delicious. The only thing I would suggest is to maybe add a bit more oregano to the flour mixture. I found the platter of 24 was plenty, but another batch could easily be cooked in about 12 minutes if everything was prepped for cooking. I will definitely be making these again! We're big fans of Southern fried chicken, and these little wings definitely earned a place in our chicken wing rotation. That said, I would make some adjustments to the recipe. We all felt the wings could have used a bit more of all the seasonings. I grated the cheese very finely so it would blend well with the flour, so maybe my 1/2 cup wasn’t as much cheese as it was for the author. Maybe with more cheese I wouldn’t have needed to increase the salt. But then, no amount was given for salt. It would also have been helpful to have a starting point since with a recipe like this since there’s no real way to judge saltiness even if you taste the flour mixture. The 2 inches oil was enough to submerge the little wings as it bubbled up around them, so no turning necessary. I just gently nudged the wings a couple of times with a chopstick to make sure they weren’t sticking and were browning well. I found the wings were done in 8 to 10 minutes. I was able to get these done in two batches. By the time the first batch was cool enough to eat, the second batch was done. These Southern fried chicken wings are tasty, and this is a pretty easy, straightforward recipe. The only issue I had with the instructions pertains to the cook time. Maybe my chicken wings are smaller than most, but cooking them took 8 to 9 minutes total. I like the tanginess of the Parmesan. I'm not sure the oregano imparts much flavor. Definitely worth a try. These are great at room temperature, so make a batch and set them out all at once—otherwise by the time you finish frying the last batch, there won't be any left. Recipe looks great — but “discard the wing tips?” Never! They are loaded with the kind of connective tissue — collagen — that gives flavor and body to stock (same with skin, excess fat, and bones). Whenever I’m cutting up chickens, I toss these parts into a bag for the freezer until they’re needed for the stock pot. It’s easy to remove the fat after the stock is chilled. sanscravat, excellent tip for those who make their own stock. Take head, folks! Having quite literally cut my teeth on Southern fried chicken, I thought that I had probably had every version under the sun by now. I honestly have to say that I’ve never had it with Parmesan, dry mustard, and oregano in the dredging mix. I must try this and quickly! Lana, all I can say is, you must! I live by the popcorn and French fry rule; Salt the food on the rack right after it comes out of the pot. Just a little (until you get to know how much you like) so the heat and moisture can melt the salt onto the surface before it dries. More can be added at the table if it needs it. I have found that mixing it in with the flour doesn’t allow it to adhere as well to the chicken unless you add it directly to the skin before you dredge it. But the popcorn rule works best…well, for me anyway! All hail The Popcorn Rule! Hail, Hail! Tiffanie, I think you’ll like it. And when you do try it, let us know how it turns out. I don’t have a huge appetite but love Southern Fried chicken wings so is it possible to do this recipe and freeze some of them for another time thereby saving me the task of making them from scratch every time? I wouldn’t, Stella. The coating is going to suffer terribly when reheated—it’ll turn soggy and possibly fall off the chicken. I know it takes a little time to make them from scratch, but I really think you’d be disappointed in the frozen and thawed rendition. And that would be a shame. Wonderful to hear, Francisco! If you have a moment, kindly let us know how much you love them….